Traditional Chinese Medicine can be traced back as early as Shang Dynasty (1766-1123B.C). At the time of the early Spring-Autumn Period of the Yellow Emperor (722-480 B. C.), the oldest Chinese medical text was written. It presented theories and concepts of Qi Gong training. Chinese medicine and Qi Gong have grown side by side for thousands of years. Chinese medicine places emphasis on keeping people well, while Qi Gong places emphasis on the prevention of disease. In Traditional Chinese Medicine theory, it is believed that when a person gets ill, they have an internal imbalance in their qi (vital energy) or perhaps a qi blockage. Over the many centuries that have followed the development of Qi Gong, the influence of the ancient philosophies as well as religion have had a major impact on its development. Qi gong is divided into two major schools of nei-dan and wai-dan. Nei-dan, which means “internal elixir,” was practiced by the Taoists, and deals with lower level breathing exercises and a focused mind. Wai-dan, which means “external elixir,” was practiced by the Buddhists, and the practice focuses on the art of mediation and mental peace. Other schools of Qi Gong include Medical Qi Gong, which is conceptualized according to the theories of Traditional Chinese Medicine (TCM). These are concepts of yin and yang, the five elements, and the energy pathways. The Confucian Qi Gong school is focused on virtues and morals, kindness, tolerance, and loyalty. The Boxing Qi Gong school believes that qi training will enhance ones muscles, bones, and joints. Grandmaster Shou-Yu Liang is one of the recipients of the Coach of Excellence title, given only to the most outstanding Chinese martial arts instructors, by the People’s Republic of China. Upon immigrating to Canada, grand Master Shou-Yu Liang was selected as the First Canadian Wushu Coach. He held the position of Chairman of the UBC Physical Education and Recreation Department, Chairman of the International Wushu San Shou Dao, is an International Wushu Judge, and the Chairman of the Canadian Wushu Selection Team. In 1995, Grand Master Shou-Yu Liang was named “Instructor of the Year” by Inside Kung Fu Magazine. Sifu Saleem’s Qi Gong training began in the early 1970″s as what may be called the “hard” method. He learned through Palm Training , Fist Training and Iron Stomach conditioning. This hard training, meant striking trees until the knuckles bled, or rubbing sand between the palms, for long periods, in an effort to turn the grains to powder, or hanging from gates or high fences by fingertips for strengthening. He also trained slapping the water surface inside a container in order to make the water explode outward in a perfect funnel. The hard training continued for many years, until he met Grand Master Shou Yu, when he began seriously training the “soft” method of Qi Gong, which is internal training. Internal training is based more on meditation and Chi cultivation, circulation, Five Elements, and balancing mind and emotions, body and spirit. Sifu Saleem teaches both hard and soft methods at the Lam Tang school, but in consideration of health and safety concerns, there will be no tree hitting! Qi Gong is the art of developing vital energy particularly for health, vitality, mental elevation and spiritual cultivation. Yes, they are the same. 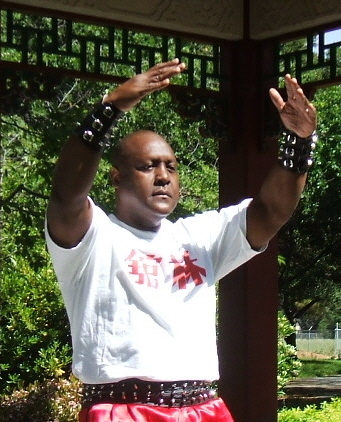 “Chi Kung” is the usual English spelling, whereas “QiGong” is the Romanized Chinese spelling. In Romanized Chinese, “q” is pronounced like the English ch’; and “o” like the English “u.” Hence, both “Chi Kung” and Qi Gong” should be pronounced like the English “ch’i gung”. Are there many types of Qi Gong? Is Qi Gong the same as Taijiquan? They are different, although Taijiquan (if it is practised the way traditional masters practiced it) or Tai Chi, makes extensive use of Qi Gong. Basically, Taijiquan is a martial art, whereas Qi Gong is a collective term for various arts of energy, which may or may not be used for martial art purposes. The movements of some Qi Gong types resemble those of Taijiquan, whereas many other Qi Gong movements are totally different from typical Taijiquan movements. What are the benefits of practicing Qi Gong? Eliminating illness and promoting health. Many Qi Gong types focus on only one or two of the above categories, but a few cover all the five. For example, most types of medical Qi Gong aim mainly at curing illness, virtually all sexual types of Qi Gong emphasize solely on youthfulness, whereas Shaolin Cosmos Qi Gong touches on all the above five categories of benefits. What kinds of illness can practicing Qi Gong overcome? According to Chinese medical philosophy, practicing Qi Gong can cure as well as prevent all kinds of illness, including diseases like asthma, diabetes, and hypertension which are generally considered “incurable” by conventional medicine. Practicing Qi Gong has even been found effective for overcoming some psychological problems. How does practicing Qi gong help with so-called incurable diseases? One must, first of all, realize that the conventional medical paradigm is only one of many ways to look at health and illness, and it is not necessarily the only correct way. According to the Chinese medical paradigm, there is no such a thing as an incurable disease, although a patient may be incurable if his disease, even a simple one, has done damage beyond a certain threshold. No disease is incurable because it is our natural birth-right to overcome all types of diseases if our psychological and physiological systems are working the way they should work. Illness occurs only if one or more of these natural systems fail in their functions. When all our systems are functioning naturally, the Chinese figuratively describe this condition as harmonious chi flow, i.e. the energy flow that supplies the right information to every part of our body (and mind), that provides the right defense or immunity when needed, that repairs all our wear and tear, that channels away toxic waste and negative emotions, and that performs other countless things to keep us alive and healthy, is functioning the way it should. If this harmonious chi flow is disrupted, illness occurs. The forte of Qi Gong is to restore and enhance this harmonious chi flow, thus overcoming illness, irrespective of the labels one may use to define its symptoms, and promoting health, which the Chinese have always considered to be more important than curing diseases. It is significant to note that the claim of Qi Gong to overcome illness and promote health is not based just on the above philosophical explanation, but on thousands and thousands of practical cases. How is Qi Gong related to Kung Fu? All great Kung Fu makes use of energy training (which is Qi gong) to develop internal force, without which it remains at its external, mechanical level, which is considered by Chinese martial artists as rough and low-class. Hence, a Kung Fu master may look gentle and non-assuming, yet with his internal force he can cause much damage to his opponent if he wishes. Moreover, his internal force does not diminish with age, and he can apply it for peaceful use in his daily living. Unlike many other systems of martial arts where the training itself often results in physical, as well as emotional injuries, proper Kung Fu training with Qi Gong enhances harmonious chi flow, thus promotes health, vitality and longevity. By learning how Chi moves in the body, and how it can be created and manipulated, Kung Fu practitioners can use it to increase their striking and blocking power, have more energy, learn how to relax more effectively, and even heal others. 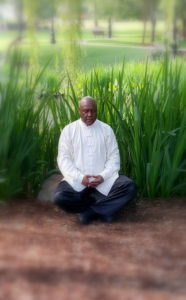 How is QiGong related to Zen or meditation? There are three aspects in all types of Qi Gong, namely form, energy and mind. If you practice only the form, without the energy and the mind dimensions, then you are merely performing physical exercise, and not Qi Gong, for there is no training of energy. For an effective control of energy, you have to enter what is called in modern terms “a Qi Gong state of mind”. In the past, this was called “entering Zen” or “entering silence”. When you are in Zen or a meditative state of mind, you can, among other things, tap energy from the cosmos and direct the energy to flow to wherever you want in your body. It is this mind aspect of Qi Gong, even more than its energy aspect, that enables Qi Gong masters to perform amazing feats.